Encontrei 94 Hotéis em . Escolha a data de entrada e saída para ver os hotéis disponíveis em . Sem informar as datas, os preços com (*) são preços médios de cada hotel e nos arredores até uma distância de 30 km. Este encantador hotel está localizado no centro da pitoresca e pitoresca cidade de Talsi, no norte de Kurzeme, junto ao Lago Vilkmuizas. O Hotel Talsi disponibiliza quartos confortáveis, todos com uma casa de banho com um chuveiro. O pequeno-almoço é servido no restaurante do hotel, que oferece belas vistas para o lago. As refeições são servidas apenas mediante acordo prévio, enquanto café e chá podem ser apreciados na recepção. Há também 2 salas de conferências para até 40 pessoas. A costa do Mar Báltico e o Parque Nacional Slitere, com as suas dunas, florestas e aldeias históricas, estão apenas a 35 km do Hotel Talsi. Existe um ginásio ao lado do hotel. This family run establishment is located in the centre of Talsi. It offers rooms in a fully renovated historic country house. All feature an individual interior design and free Wi-fi. The rooms of the Guest House Martinelli have a flat-screen TV with satellite channels, a work desk and a private bathroom. Most have wooden decorative elements. In the mornings breakfast is served in the Martinelli’s restaurant. Later in the day it serves international dishes along with Latvian specialities. It also houses an Enoteca that offers sommelier consultations. The Martinelli’s front desk is available 24-hours a day. The property offers free private parking. The guest house is located a 5-minute walk from the nearest bus station. All the rooms in Saule feature renovated, century old wooden floors and are decorated in classical style, with light pine wood furniture. They all have a flat-screen TV with satellite channels and a DVD player, as well as an electric kettle and a bathroom with a shower, a hairdryer and free toiletries. Saule is surrounded by a green garden with a rock garden area, as well as barbecue facilities and a private pond. At an extra charge, guests can fish, ride a horse or enjoy a boat trip, as well as shuttle services. Baron Fircks Manor, where Talsi District Museum is located, is only a 3-minute walk away. There is also a cafe in the castle. Talsi Bus Station is a 15-minute walk away. The light coloured house features a bedroom located on the upper floor and a living room that will provide you with a seating area. There is a kitchen with a microwave. Featuring a shower, private bathroom also comes with a hairdryer and free toiletries. Talsu Pirtiņa Vijoles is surrounded by a garden with barbecue, grill and picnic facilities. Guests can enjoy a meal, play games and relax under a canopy in the garden. There is a table to play novuss, a form of billiards popular in the Baltics, and the staff can also arrange for guided tours of Talsi and it’s surroundings. It is 2 km to the stable offering horse riding, Kamparkalns mountain is 5 km away. Bicycle hire and shuttle services are available at an extra charge. Guests can charge their electromobiles free of charge and use distance skiing rails in winter. There is a pet hotel and a babysitter too available at an extra charge. Motelis Aldari is located in Talsi by the Pastendes Lake and next to the Pastenders Sports Centre. It features a banquet, as well as a hunting trophy room. The private bathrooms come with a shower and free toiletries.There is also a shared kitchen with a dining table, an oven, a stovetop and a microwave available to guests. Extras include barbecue facilities, bed linen and towels. 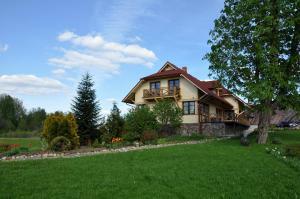 The property is located 6.2 km from Talsi.